This style of screen is known as tagasode meaning “Whose sleeves?” The word was used often in Japanese poetry, particularly during the Fujiwara and Kamakura periods, as a “pillow-word,” or leading into a poem. Tagasode traditionally conjures up the image of a beautiful woman whose presence is missed; elegant kimono sleeves, and the fragrance arising from the garment, were believed to evoke melancholy thoughts of an absent loved one. The tagasode theme also became a favourite among some late-fifteenth-century lacquer-makers, who depicted plum flowers and incense burners that suggest fragrant scents, and who cleverly incorporated the letters reading tagasode into their pictorial designs. 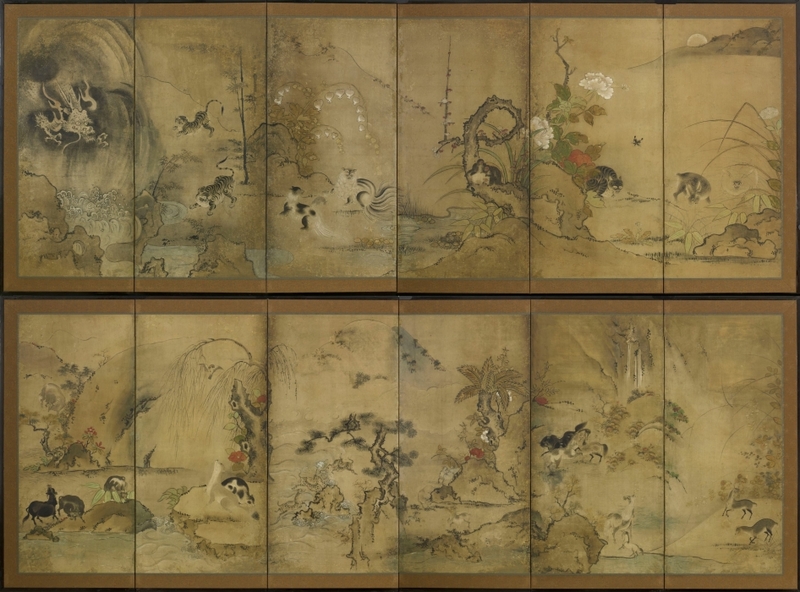 While these painting may be an interpretation of a Heian literary theme, it was also ancient practice to drape beautiful kimonos over clothes racks and employ them as temporary, movable partitions, much as folding screens were used. At picnics colourful kimono were draped over ropes to create temporary enclosures. Apart from its utilitarian function, the practice of hanging or draping kimonos offered the opportunity for an ostentatious display of valued possessions, in the manner of a fashion show. Tagasode screens of clothes-laden racks thus bear a multifaceted symbolism; the kimono racks in the image represent temporary partitions, and the actual screens serve this purpose in real life. The furosaki byobu (screen) is specifically designed for use in chanoyu (tea ceremony). Placed in the corner of the tea house it denotes the season or whatever theme the host has chosen to portray. It works as a backdrop for the kama (kettle) and also for the various precious objects such as the koro (incense burner) and chawan (tea bowl) used during the performance of this ancient ritual. SKU: 7668. Categories: Furosaki, Screens, Two Fold. Tag: tagasode.